We will be Celebrating the Life of Finly Rae Budach at 1:00 P. M. Friday, at the LeSueur River Lutheran Church, rural New Richland. The Reverend Brian Gegel will officiate. Interment will be in the church cemetery. A time for remembering and sharing Finly stories will be from 3:30-8:00 P.M. on Thursday at LeSueur River Lutheran Church, and then again one hour before services on Friday. We lost smiley, giggly, precious Finly on Saturday, March 17, at St. Mary’s Hospital in Rochester, after only 7 short years. Finly, blessed our lives with her arrival on December 17, 2010, in Rochester, Minnesota, the daughter of proud parents Nick and Erin (Thompsen) Budach. 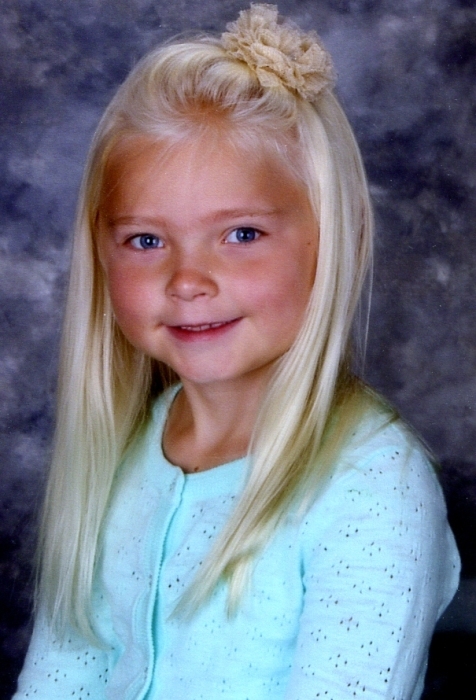 Currently a first grader at NRHEG Elementary in Ellendale, Finly made quite an impact on all of our lives. Her bubbly, happy spirit kept us busy and brought much joy to our lives. Enthusiastic about all activities she participated in, Finly enjoyed gymnastics, dance, swimming, church activities, reading chapter books, singing, and crafts to name a few. She loved her role as big sister. Playing and hanging with brother Reed made her precious smiles even brighter. Also, an animal lover at heart, she and her sidekick “Renna” were never far apart. Family, who feel blessed to have had her in their lives include: parents Nick and Erin Budach and brother Reed of New Richland; grandparents Rick and Lana Thompsen of Ellendale and Gary and Kris Budach of New Richland; great grandparents: Sonja Thompsen of Owatonna and Jim and Arlene Cummins of Rochester, MN; aunts and uncles: Kristi Thompsen and her son Dekker Tanya Schlinger and children Aubrey, Sydney and Mallory, Holly and Ryan Nissen and children Cambria, Charlie and Calvin, Dan and Kari Budach and children Hannah, Bo, and Meela, and many great aunts, uncles and cousins. She was preceded in death by her great grandparents: Betty and Buddy Berg, Mildred and Gene Budach, and Kenneth Thompsen. Blessed be our sweet, sweet Finly.